Last Saturday I took the girls to a birthday party for a pair of their twin friends Abi and Bell. 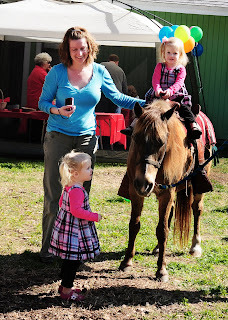 It was fun (hey there was beer there) they had a petting zoo and pony ride. The only issue I had with this party was the time...2:30. 2:30 is right smack in the middle of naps, but I was pleasantly surprised that they held it together pretty well. 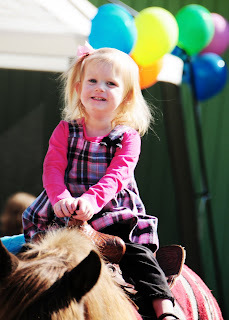 They had a great time running around, petty the animals, and riding the pony! Every time we have had an opportunity to ride ponies Emerson has sad no thank you! The last time was at the Twin MoMs holiday party. She was very excited till it was actually her turn then she was not so happy with the idea. 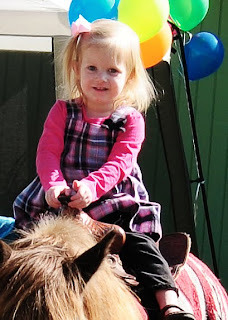 This time her sister did it (her first ride WAS at the holiday party) and then when her turn came she let me put her on and she enjoyed it like she had done it many times before. These pictures are so cute--your girls must have had so much fun. My name is Abigail Pogrebin; I'm an identical twin and former 60 Minutes producer who just published a book about twins called "One and the Same." I think any parent of twins or multiples will find much to chew on and maybe some guidance as to how to dodge pitfalls of doubleness. I'd love to speak to you about the possibility of a book review and/or author Q&A. My email is apogrebin@gmail.com, website:www.abigailpogrebin.com. Hi Abigail! Thanks for reading my blog!! I would love to read your book and do a book review. That would be very cool. I'll email you. I am a member of my local Mothers of Multiples and Im sure plenty of them would be very interested in your book as well! Where Is THE Waffle Man?? ?